On a sunny beach day, three friends enter a sand castle contest to see who can build the deepest moat, the tallest tower, and the longest wall. During the competition, the friends try to see who is winning by measuring their castles with feet, shovels, and spoons. Here's a peek inside the book---to show you the illustration style and give you an idea of the amount of text on a page. 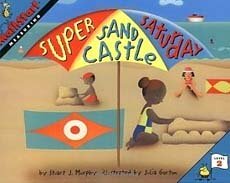 The first spread shows Larry the Lifeguard talking to the kids about the sand castle building contest. 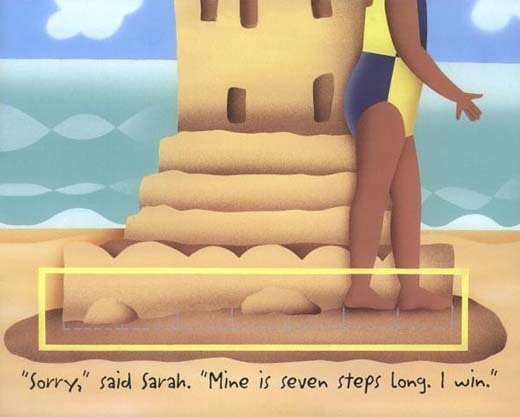 The page just below that shows one of the contestants trying to see if her sand castle is the biggest. At this point in the book, she and her friend do not realize that their measurements are off because their feet are different sizes. Later, Lifeguard Larry takes accurate measurements and explains why spoons and shovels and human feet aren't as reliable as our standard system of measurements. -"Pick distances around the house or classroom and measure them using 'baby steps' and 'giant steps.' Is the hallway more baby steps or giant steps long? Are there more baby steps or giant steps between the couch and the computer? " -"Have friends take turns lying down on the floor and measuring each other from head to toe using straws, and then a ruler. Make a chart that shows the length of each person in terms of different units of measurement."